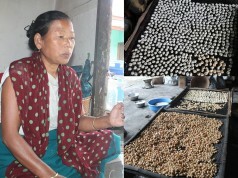 At her tiny food stall located at Kakching Bazar in Thoubal district which is about 35 km away from Imphal, the 35-year-old lady entrepreneur Yendrembam Umeshori Devi is busy preparing various food items with black rice locally known as Chak-hao. 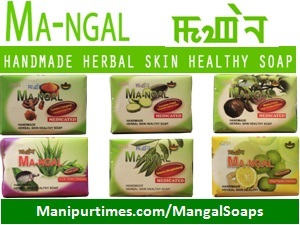 The food items of varied taste are prepared under the brand name Kakching Chak-hao. 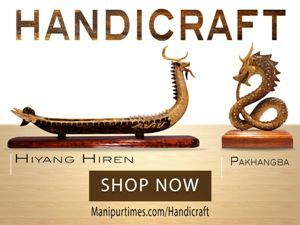 The brand Kakching Chak-hao is a symbol of women empowerment, hard work and dignity of labour. 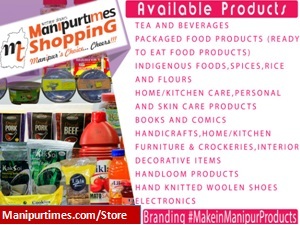 She wishes to open up a show room for her products and a training centre. However, her dream cannot be materialized due to paucity of fund. Yensembam Umeshori Devi, 35 daughter of Yensembam Maijao, a blacksmith by profession hailing from Kakching Khunyai Leikai was initiated into the business of making varied food products using the locally available Chak-hao in 2008. 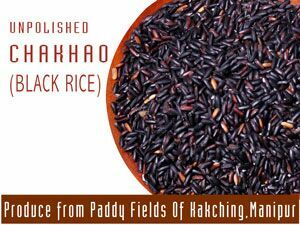 The black scented rice popularly known as Poireiton Chak Hao in local tongue which was widely used in Manipur since time immemorial in the traditional feast and festivities etc is the main raw material Umeshori uses in preparation of varied food items under the brand name Kakching Chak-hao. The black rice Chak-hao is purchased from the local farmers at the rate of Rs. 80 to 100 per kg. 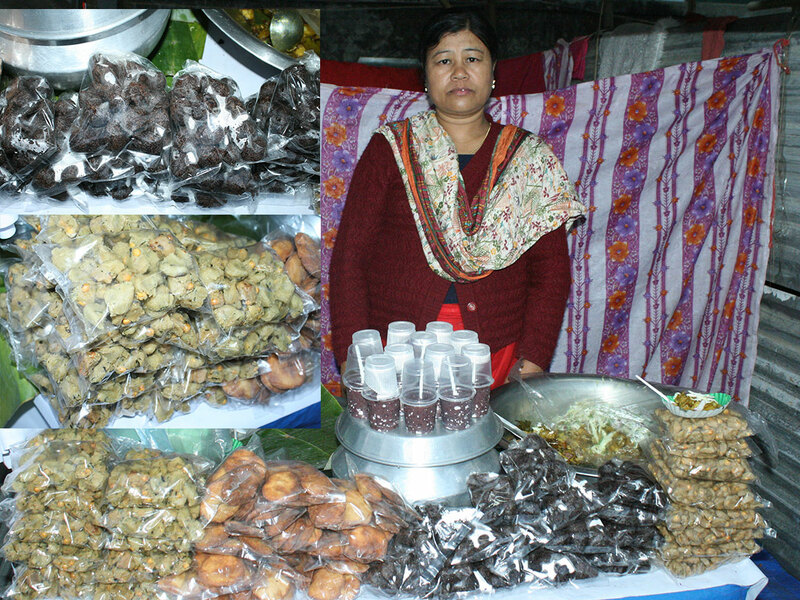 Under the brand name ‘Kakching Chak-hao’, the lady entrepreneur produces about eight food items of various kinds with the locally available raw material Chak-hao. The firm is popular for its sweetie varied food items including Chak-hao Matum, Chak-hao Tal, Cheng Mangal Bora, Chengi Tal, Chak-hao kher. 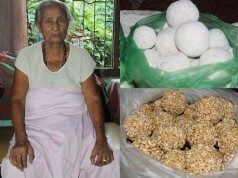 Among the food items she prepares, Chak-hao Matum is the best choice of the costumers. 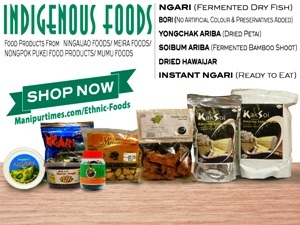 Interestingly, Umeshori never uses any chemical flavor or additives in preparation of the food products, but manages to give them a natural taste. 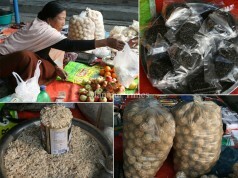 Preparation of Chak-hao Matum, Chak-hao Tal etc undergoes a simple process. First, the black scented rice ‘Chak-hao’ are pounded in a Shumbal (Mortar) using pestle. The pounded rice is mixed with little amount of water and sugar, and Kneaded it properly till it forms a nice dough. Then, the paste is fried with refine oil in a hot pan. 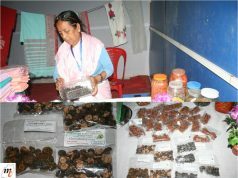 In the journey of her venture on food Industry, Umeshori, for the first time, displayed her food items prepared from Chak-hao (black rice) during the Chinjak Festival 2009 held at GM Hall, Imphal in which she could bag second Runners’ up . Buoyed by winning the award, she thought of making more food items of varied tastes prepared with the locally available black rice. She could win best award in the Chinjak festivals held in 2010, 2011 and 2012 for her masterpiece Chak-hao Matum. She learnt the art of making varied food items from her mother, who was running a small hotel at Kakching Bazar with which she endeavored to maintain her family with nine kids. Right from her tender age, Umeshori started helping her mother by engaging herself in the preparation of varied food items, Tea for the costumers coming to their hotel. With growing age and physically weak, her mother is now retired from her hotel work and Umeshori is looking after the day to day affairs of the hotel work. I was often obsessed with the thought to innovate some food products with unique taste using the locally available black rice Chak-hao which possesses medicinal values for attraction of more costumers of our hotel. Motivated by this thought, I procured some Chak-hao rice from the farmers of my locality and started my first venture on preparing some food items like Chak-hao Matum, Chak-hao tal, Chak-hao kher. The initial venture of transforming the locally available black rice Chak-hao into a new zest of taste in the form of ready to food item proved success with good profit and good feedback from the costumers, recalled she. 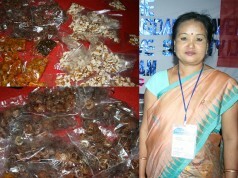 Buoyed by the initial success, I prepared varied food items exclusively of Chak-hao rice under the brand name Kakching Chak-hao and started taking part in various food exhibitions and Melas including Chinjak festival, Manipur Sangai festival etc which immensely helped in promoting and popularizing the products, she said. 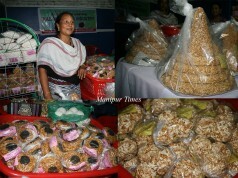 No doubt, sales of food brands of Kakching Chak-hao scooped about Rs 1 lakh within a few days at its pavilion opened up for the first time during the Manipur Sangai festival 2013 held at Hapta Kangjeibung, Imphal organized by Tourism Department. 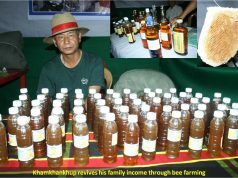 ‘Good taste!’ – is one apparent feedback my farm continuously receives from the costumers whoever have tasted the varied food brands of Kakching Chak-hao. 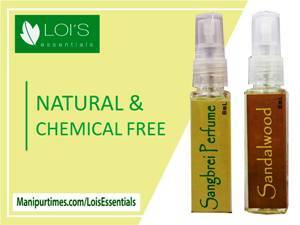 With costumers’ demand on the rise and good monthly turnover from the business now, I can now manage my family comfortably. 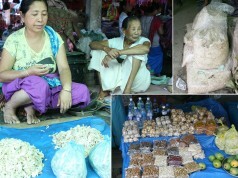 She said that products of Kakching Chak-hao are available at the food stall located at Kakching Bazar all the year round. 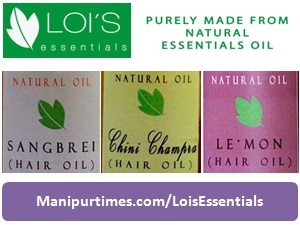 She wishes to expand her business to provide employment to others, the woman section in particular. 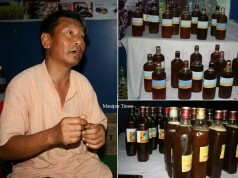 Kakching gi singju ga manggantan Delhi da thabi rak ohhhhh…..